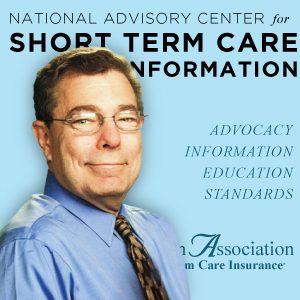 The National Advisory Center for Short Term Care was established to create awareness for often overlooked option for financing long-term care. Many individuals who can not health qualify for traditional long-term care insurance CAN qualify for a short-term care insurance policy. Many people who cannot afford a traditional LTC policy find they can afford a short term care policy. And, when you consider that about half (49%) of all long term care insurance claims last 1-year or less, a short term care insurance policy can fit the bill. To learn more about short term care insurance visit two websites.